Every woman dreams about having a spa in her own home. Imagine being able to get a facial on demand! Thanks to technological advancements, now you can get a facial in your own home at any time you want. One of the newest technologies to become popular in the past year are microcurrent machines. They have been used in spas and clinics for facial contouring, toning and firming﻿﻿ of aging skin. Now they have been designed for personal use so that you can enjoy their benefits at home with a best microcurrent facial machine. Tools similar to this have been used to help medical patients with facial paralysis for years, and only recently they have been introduced in the beauty world. What is a Microcurrent Facial Machine? First lets find out what exactly is a microcurrent machine , how it benefits your skin and find the best microcurrent machine for home use. A microcurrent facial machine for home use does just what its name implies: it runs an electrical current between two wands that you touch to your skin. It is similar to your body’s bio-electric currents, that can give instant results and regular usage can help you maintain a healthier and younger looking skin. They are safe to use and there is no pain involved. You will be able to feel the electrical current, but it isn’t powerful enough to hurt or electrocute you. The microcurrent stimulates cellular level activity that creates large amount of ATP (Adenosine Tri-Phosphate) that drives muscle contraction, protein synthesis and muscle re-education. Muscle re-education is the process of lengthening or shortening muscles which lifts the skin and makes it firm. Your skin will feel smoother and look younger as you relax. Not only will you be able to achieve a more natural contoured look and tighten saggy skin, you will feel like you are getting a massage while doing it! There is another type of facial machines that uses microcurrent to achieve skin firming and toning. These devices are called galvanic machines and works in a similar way to microcurrent devices. They use higher direct currents in milliAmperes range, compared to microAmperes used in microcurrent devices. The device works in two ways to improve skin texture. First process is called “Desincrustation” which involves deep cleansing the skin with a negatively charged gel that draws out dirt, bacteria and other impurities. The skin is nourished by a process called “Iontophoresis”, where a positive charged gel is applied to the cleansed skin. The galvanic facial machine then effectively pushes all the nutrients like vitamins, antioxidants deep into the skin for maximum absorption. The Project E galvanic is one of the best galvanic facial machines. The device is rechargeable and comes with a roller head for face or neck areas and a ball probe for eye and nose regions. You can adjust the intensity levels through a side roller button. For cleansing mode, you can press the negative button and adjust the desired intensity level. For penetration mode positive button must be used along with positive ion gel on your face. Always move the device in upward direction and your hand must touch the metallic parts on both side of the device. The portable device is lightweight and easy to use. Recommended use is 4 times a week for best results. The Project E galvanic facial machine is a good choice for those want to enjoy the benefits of galvanic microcurrent facial device. Check the video to see it in action. The Biosincron Beauty Star is one the best face lift machine for home use that can safely erase wrinkles, reduce eye bags, lift saggy neck and revitalize aging skin. It is a premium high quality device that has been designed and manufactured in Europe which has been giving great results for years. Beauty star is made of rust proof gold-plated metallic elements and has a self–sterilizing probe that does not require any cleaning. The device is compact and cordless and comes with a 9 V alkaline battery that lasts up to 100 hours without any charging. Intensity can controlled using the adjustable dial which has 10 different levels. Select the desired intensity level and gently apply the probe on your face. If you notice a slight tingle, it means the device is working. Start with lower intensity levels first and later you can move to higher levels. Recommended usage is 25 minutes daily with each area for 2-3 minutes till you see noticeable results. Later you can reduce to once every 3 days for maintaining the look. Don’t forget to put on the Spectra electrode conductive gel that comes with it before using the device. Beauty star is a premium microcurrent device with a unique design and proven results making it on top of our list. Check out this video to learn how to use it. Cleanse your face with a soap, rinse thoroughly, and pat dry with a towel. Apply the spectra conductive gel on the desired area. Turn on the device and adjust device intensity level using the dial. Gently glide the device on your skin for 3 to 5 minutes in upwards circular directions depending on area of face as shown in video. This NuFACE microcurrent device is an FDA approved smaller, limited edition version of the NuFACE Trinity(See below). While it doesn’t attach to all of the different wands that you can buy for the NuFACE Trinity, the Mini Gift Set is a great entry into the world of microcurrent facial. Of course, since this is a smaller tool, it may be the best option for travelers who need to take advantage of precious space. It has a 3 level button for intensity control. The Mini Gift Set microcurrent face lift machine is just about the size of the palm of your hand. This also makes it a good option for younger users who don’t need all of the attachments that come with more elaborate anti-aging machines. This kit will include two ounces of toning gel with the device, which isn’t a lot, but the device is smaller than most and will use less gel. You can also order and of the NuFACE gels online to replace it, so if you really want to slather gold across your face before a treatment, go for it! The kit also includes one ounce of collagen booster infusion serum, which will help to firm your skin after using the microcurrent facial device. Check the below video to learn how to use Nuface for best results. The New Spa Eye Zone Lifting Massager is a tiny, inexpensive microcurrent machine for sale who specifically want to lift and firm their eye area. It is also perfect for working on small lines in hard-to-reach areas on your face due to smaller tips and not just the eye area. If you are looking for a machine to firm large cheek or neck wrinkles, this is not the machine for you. This adorably small device works from 2 AAA batteries, which are included in the kit that comes with it. No worrying about charging or plugs when using this machine! The power of this machine is low enough that you can barely feel it, which is good for its purpose because the skin around the eyes can be thinner and more sensitive. It has a 5 level intensity setting option for varying level of muscle contractions. The machine comes with lotion to wet the nodes and area before treatment, but it also recommends that aloe vera gel can be used in place of this lotion if you run out or don’t like it. It also comes with eye masks to wet and moisturize the under-eye area to improve results. You can use the New Spa daily for ten to fifteen minutes initially for noticeable results around the eyes. Once you get the desired results you can reduce the frequency to maintain the look. 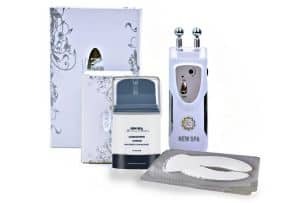 The NuFACE Trinity facial trainer is one the best microcurrent facial machine that can give spa like results. With its Trinity facial trainer attachment, you can firm your skin with daily treatments lasting anywhere from five to twenty minutes. It is also the only FDA cleared and clinically tested award winning hand held device for facial toning. The machine will even shut itself off after twenty minutes so that your toning experience is safe and healthy. The self-timer and automatic shutoff is great for you if you are the kind of person who accidentally overdoes beauty treatments (ever leave that mud mask on too long?). It is cordless and takes 12 hours for getting fully charged. Intensity can be controlled through a five level button. The NuFACE trainer has a smart skin sensor and interchangeable attachments to target basically any of your needs. In order to use it, you will need to use the charging cradle and power adaptor that come with the trainer to charge it, and then you will smear a gel (that also comes with the kit) across the electric nodes before placing it on the parts of your face you want to tone and contour. Additionally, you can buy attachments to customize the NuFACE trainer to fit exactly what you want. A wrinkle reducer attachment can be bought to work on large facial wrinkles, and you can buy Trinity Ele attachment to focus on smaller, more sensitive areas around your eyes and lips. You can also customize the kind of facial training you do by using different types of gels – who knew? NuFACE has many type of gels like anti-aging gels, collagen-boosting gels, brightening gels, and even 24-karat gold gels. Once you’ve use the gel that comes with your starter kit up, think about your specific purpose for buying the facial trainer and try a gel that aligns with your goals. Recommended usage is 5 minutes per day for 5 times a week for first 2 months then you can reduce the frequency as desired for maintaining the results. ​At first glance, the 7e Wellness Myolift looks like a glucose meter machine, but don’t let that turn you away from it. Myolift is also FDA cleared making it one of the best microcurrent facial toning device. While it isn’t the prettiest or girliest machine, its large LCD screen is useful for showing precise readings, including electrical intensity and time passed since beginning each treatment. The buttons below is screen also make adjustments easy. This is great if you are new to giving microcurrent facials to yourself! It has two modes “Educate” and “Erase” with each mode having a unique frequency with 2 level settings to penetrate the skin with different strengths. The machine comes with two wands with each wand having two separate tips for delivering electric current. The wands are sleek and slim, which makes them easy to hold, especially in comparison to some of the bulkier machines. To prepare the wands for use, you will need to put the seaweed gel that comes with the machine on its nodes. If you are looking for natural ingredients, seaweed gel is a good, more natural choice than many of the other gels on the market. In educate mode, you will hold one wand on your face, place the other wand below and move the bottom wand up towards the top, pinching the muscle in between and pausing for 3 to 5 seconds. The educate mode is useful for larger areas of your face. For erase mode, you need to make quick short moves without pausing. Erase mode works well for wrinkles and fine lines around eyes, mouth and nose. Check this video that shows how to use the Myolift. While this device isn’t as small as the NuFACE mini, it is lightweight and small enough to be portable and would be ok to travel with if you have enough space in your bag. It uses rechargeable batteries to work, so you don’t have to worry about tangled cords or being next to an outlet while using it. You can use this daily till you see desired results and the duration can be 10 to 15 minutes depending on area you wish to cover. The SteamSun facial machine comes in a package that looks a little like a doctor’s bag, but don’t worry: you don’t have to be a doctor to figure out how to use it. Like any microcurrent facial device, this one will need electrode gel to work safely. This machine does not come with gel, so make sure that you buy some before you use it. The package does come packed with enough other tools to make up for this, though. If you like variety in your beauty routine, this device may be a good choice for you. The facelift machine comes with a charging cable to provide power, two sets of copper nodes, two sets of calabash-shaped nodes (which appear beaded and will give a unique massage feel), and two cotton-stick nodes. On top of all of those choices, it also comes with a hammer-shaped tool that provides heating and cooling touches to your face and gloves to wear for safety and cleanliness while using the tool. But it does not come with a scrubber. The steam sun gives good results and can be used on whole body for improving blood circulation and to relieve pain in addition to firming and toning your skin. The SteamSun’s options even extend to a timer that allows you to set a time limit of up to thirty minutes and options for to change the intensity of the microcurrent you use. All of these choices do come with a drawback, though. The instructional manual and DVD that come with the machine are not well-translated into English and may make all of the tools seem more confusing. Nevertheless it is one of the best microcurrent device for getting professional results at home. Anybody, young or old, can benefit from a best microcurrent facial toning system. The electric current tones the face. Think of it like you would think of a treadmill or other exercise machine: the microcurrent wand will give your facial muscles a workout. Older women can use microcurrent machines for facelifts and wrinkle reduction therapies. Younger women can use them as preventative tools to train the face and clear up acne. Some users have even seen these machines lessen the appearance of rosacea. To get noticeable results of a microcurrent facial, regular use is a must. Check out these Nuface before and after photos to see the differences you can expect from using it regularly. In an independent clinical study done on Nuface Trinity users, 85% experienced improvement in facial contour, 80% saw smoother skin while around 77% of them says they got more toned skin. Check below Nuface before and after photos on two women for 5 minutes a day, 5 days a week for 60 days. Both of them experienced improvements in jawline definition and jowl definitions. 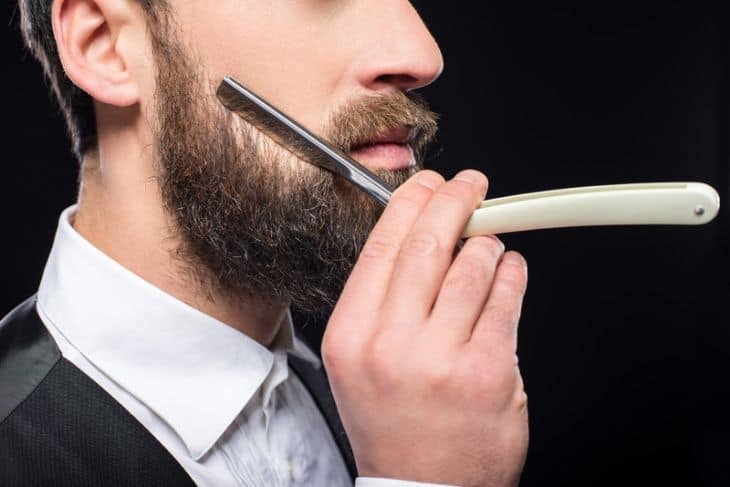 Microcurrents have been used on the human body far the last 50 years and there are no major side effects and is considered to be completely safe. It is minimally invasive non-surgical procedure with no downtime needed. These can be avoided by proper hydration after each treatment. Drink as much water as you can for up to 2 hours after a session to counteract the side effects. If in doubt, it is always better to consult your physician before proceeding with a microcurrent facial. The average cost of performing a microcurrent facial by a dermatologist at your local spa can vary from $200 and above per session depending on the location. Considering you will need atleast 10 to 15 sessions the total cost can run above $1000! At home microcurrent facial is much more economical with devices starting from $50 available today. You can get the top quality machines for around $300 which is still cheaper than doing at a Spa. The devices are easy to use and maintain which makes them a convenient way to start your microcurrent facial journey! Looking for a microcurrent machine for home use means you need to think about what areas of your face you want to target and tone. FDA Approval - FDA approved devices are always recommended if you are using home devices. Check if the device has been approved by FDA for facial toning. Intensity Control- The devices usually have different levels of intensity setting controlled by buttons. So for better control look for device with wide range of intensity levels to choose desired current strengths for the treatment. Cordless- Compact portable cordless devices are easier to use on face by yourself. In general these type of devices will be equipped with rechargeable batteries or alkaline batteries to enable wireless use. You will also need to think about how much space you have for a machine and whether or not you intend to travel with it (some are much bigger and bulkier than others). Timer- An inbuilt treatment timer is a handy feature to have for a home device. You can set the timer and perform the facial till the device alerts the time. Add-On's- Next, you will need to think about what add-ons you will want for your machine (extra wands to reach the eye area? Check if it has roller probe or bipolar probe heads that can work on face and eye areas respectively. Does it come with Eco-friendly conductive gel? and ask if the machine you get will be able to work with the add-ons you want. Using a microcurrent facial machine at home is relatively easy once you understand the basics and get some practice. Though the design and shape of these handheld microcurrent machines vary for each brand, the usage is similar. Before you use the device, make sure it is safe on your skin. Always consult your dermatologist in case you have any know skin problems or other known diseases. In general most microcurrent facelift machines have an easy use design. Step 1. Fully charge the microcurrent device before use if it is a rechargeable type or get new AA or AAA batteries for non-rechargeable devices. Step 2. Next step is to properly cleanse your skin with a good cleanser to remove any oil, dirt or makeup residues. If the skin surface is not clean the effectiveness of the device will be reduced. Step 3. Apply the gel primer that makes the skin wet and conductive. Use sufficient amount of gel primer to ensure your skin is fully wet and the device can glide smoothly over the surface. The device should not tug or pull the skin. Step 4. Now switch on the device and select suitable intensity level. Start with lower levels and move on to higher levels gradually. There will be two nodes and both should touch the skin for the microcurrent to pass through the skin. Glide the device nodes smoothly over the face. Step 5. Apply medium pressure like doing a face massage and move the device in upward motion to uplift and tone the skin. Do not hold the device in same position for more than 5 seconds. Check out this video which demonstrates the recommended motion pattern for a microcurrent device. Step 6. After the session wipe out the gel primer and apply a good moisturizer. Step 7. Recommended usage session of microcurrent machine is daily 15 to 30 minutes atleast which covers all targeted face areas. Repeat this 5 times a week for the first 60 days or till you get desired results. The results can then be maintained with 2 to 3 time’s weekly use. 1. What are the expected results? You can get tighter firmer skin and visible facial lift benefits like improved jaw and smile lines, reduced eye bags, reduced wrinkle and fine lines. It is always better to record the changes as you continue the treatment. 2. How soon can you expect results? With regular recommended usage duration of each device one can start seeing changes as soon as one week itself. For noticeable results you need to use at least 3 to 4 weeks. 3. 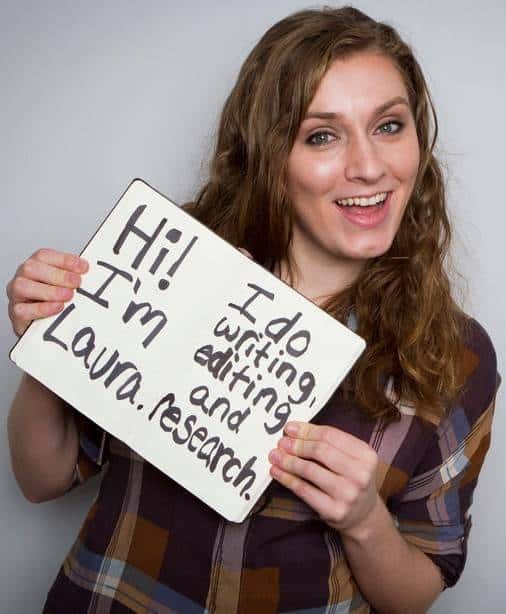 Is it painful and will I feel any current while using? Most devices are painless and harmless and will not hurt. One will feel a mild tingling sensation when current is passed through face. So it is better to start at lowest setting and move up gradually as you get used to the sensation. 4. Do I need to use a gel while using the device? Using a conducting gel is essential for improving the conductivity of electricity through the skin. If adequate gel is not used, results will take longer to achieve. 5. Can I use it while wearing makeup or use if I have metallic fillings? It is not recommended to use the device on makeup products as conductivity will be less. Always use on properly cleansed skin after applying the gel. If you have any metallic fillings, slight discomfort may be there. So it is better to use at the lowest intensity levels initially. So what’s the best microcurrent facial machine for someone looking to invest in at-home facials? Each machine has its own benefits and drawbacks, but the Project E Beauty is our top choice for the best microcurrent machine for home use! NuFace reviews show that this device is also quite good and is one of the most popular microcurrent facial machines on the market today. It is FDA approved and has a good range of gels and accessories. Microcurrent facial machines are fast becoming a popular home facial gadget and is a must have device for face like a facial epilator or a microdermabrasion machine! The NuFACE Trinity microcurrent machine is the one I have and I swear by it! I actually got a few cheaper ones before finding this one. Some of them so work but not as good as they claim but I found this NuFACE one really does give you a “new face”! If you are like me and slacked with facial skin care in your teens, 20’s and 30’s, you can make a comeback in your 40’s with one of these devices. I look 10 years younger!